Professor Suranovic received his BS in mathematics from the University of Illinois at Urbana/Champaign and his M.S. and PhD in economics from Cornell University. 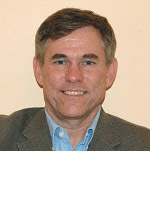 He has been a faculty member at the George Washington University since 1988. He also teaches regularly as an adjunct for Cornell University's Washington DC program. In Fall 2002, he taught at Sichuan University in Chengdu, China as a visiting Fulbright lecturer. Professor Suranovic teaches international trade and international finance theory and policy. His research interests include international trade policy analysis, fairness in international trade and the behavioral economics of cigarette addiction and dieting. He has spoken to business, government and academic audiences in Japan, Malaysia, the Philippines, China and Mongolia as part of the US State Department speaker's programs. He has published in numerous academic journals including the Journal of International Economics, the Canadian Journal of Economics, the World Economy, and the Journal of Health Economics. He has recently completed a book titled, "A Moderate Compromise: Policy Choice in an Era of Globalization." In it he offers a critique of current methods of policy evaluation and choice and suggests a simple, principled, and moderate alternative.